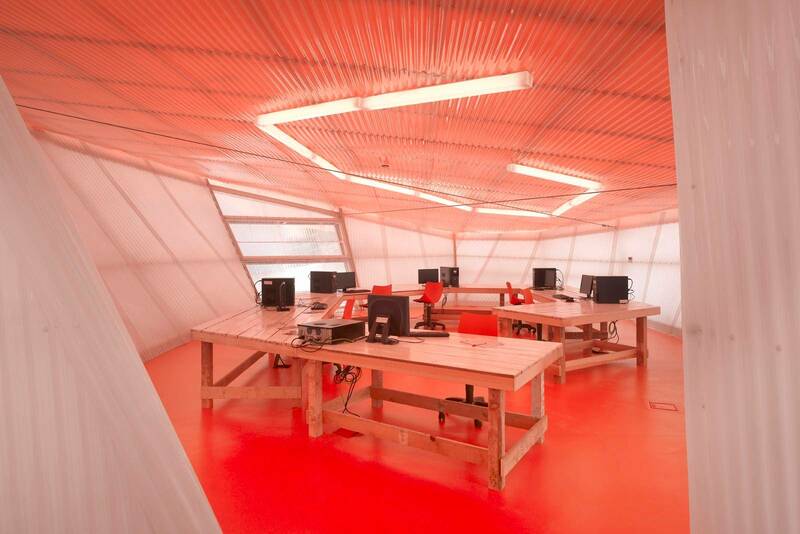 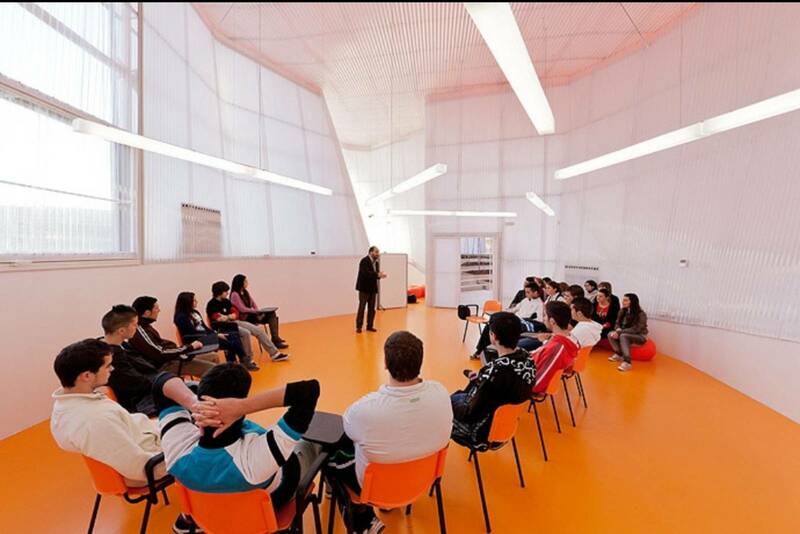 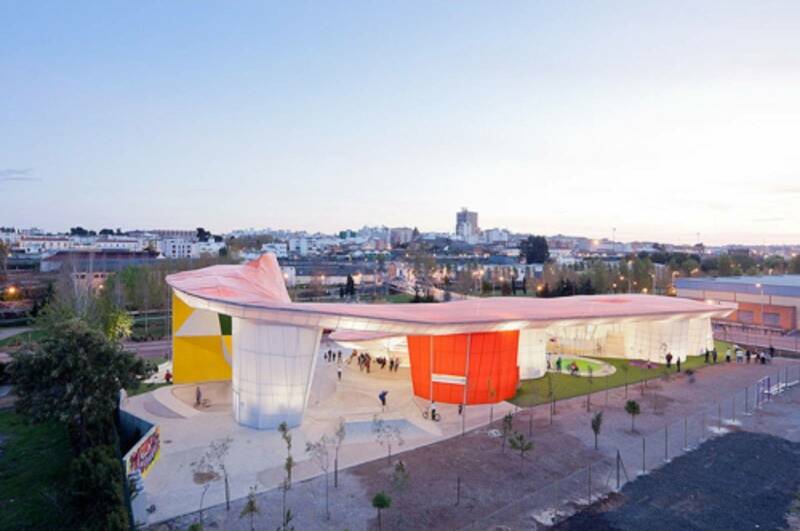 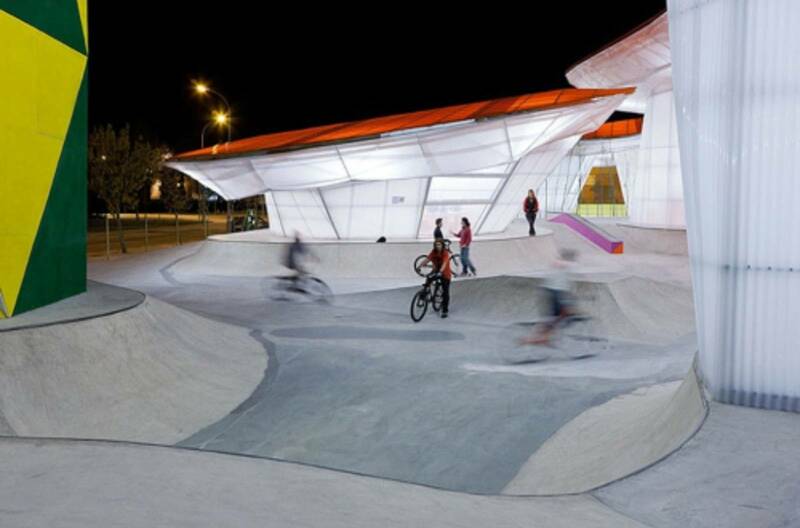 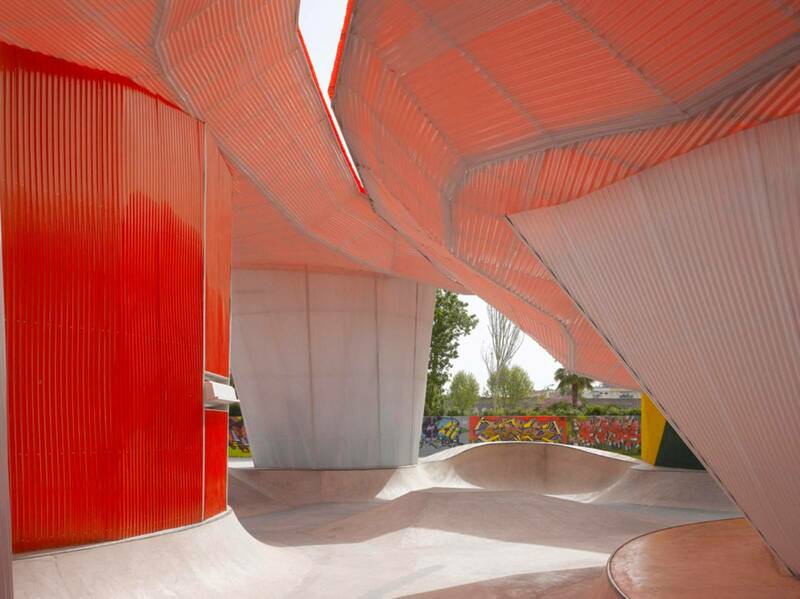 The Youth Factory is a multi-disciplines complex of 3000m² designed for young people, kids or teens. Access free, opened, but covered by a translucent roof, the building is made up by several areas both independent and adjoining. 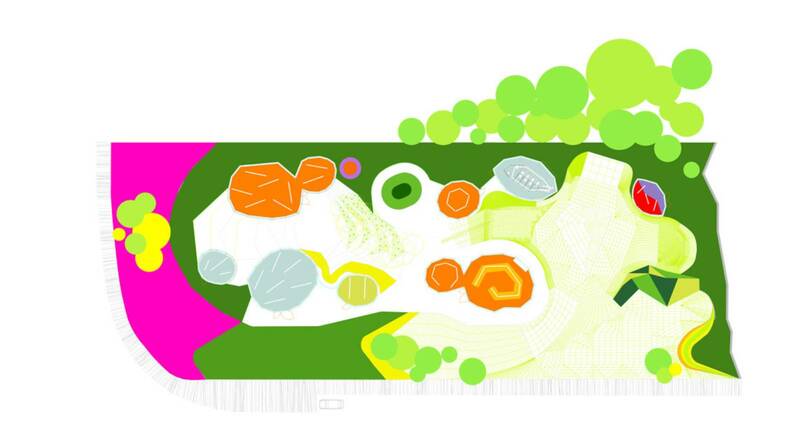 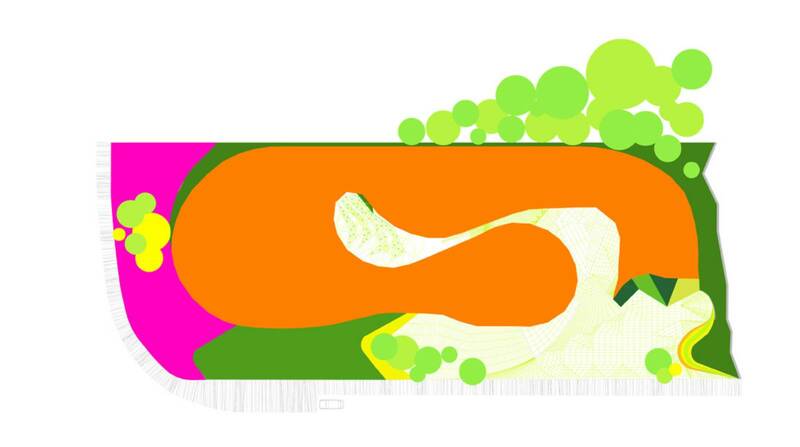 Greenery and colors complete this amazing substructure entirely serving the future, its body and mind. 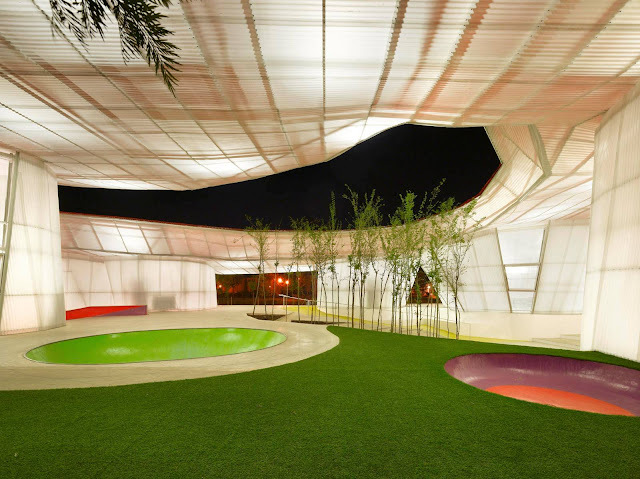 A curvaceous youth centre and a sober addition to Roman ruins explore the conflicting elements of Mérida's urban identity - both colourfully kinetic and quietly contemplative. 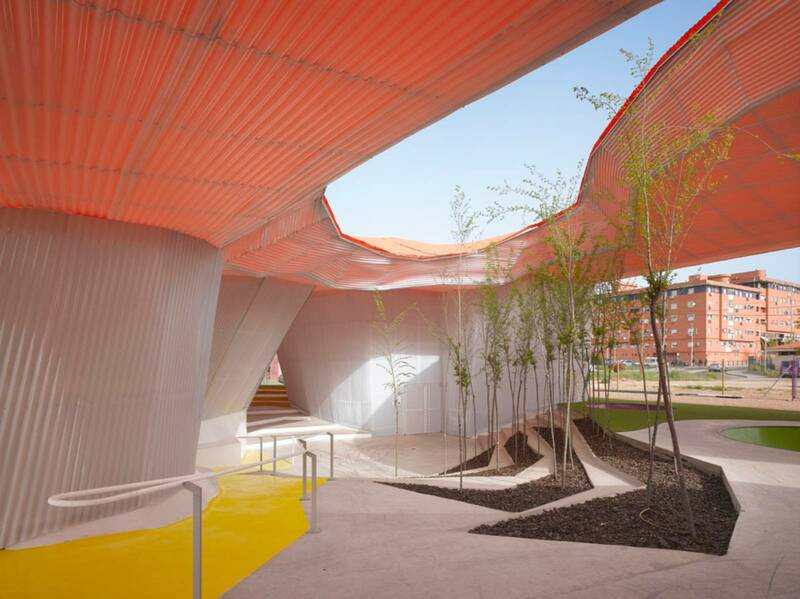 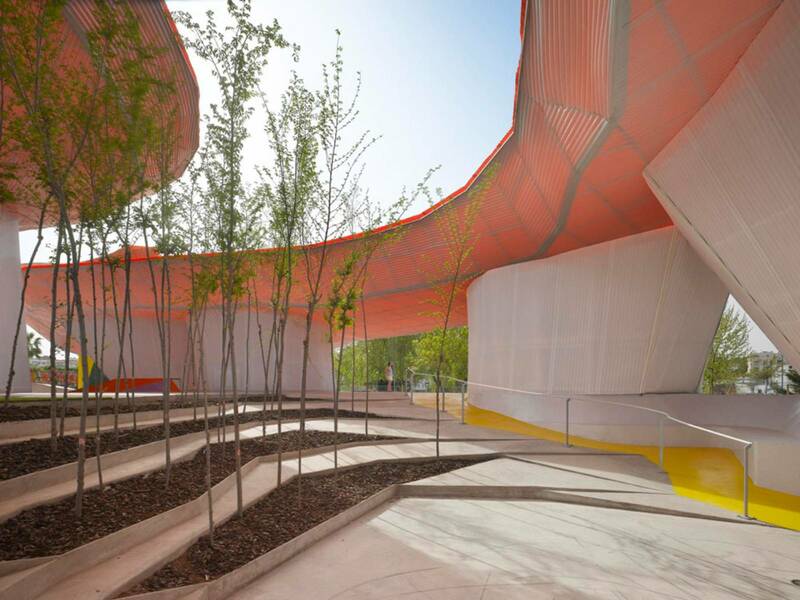 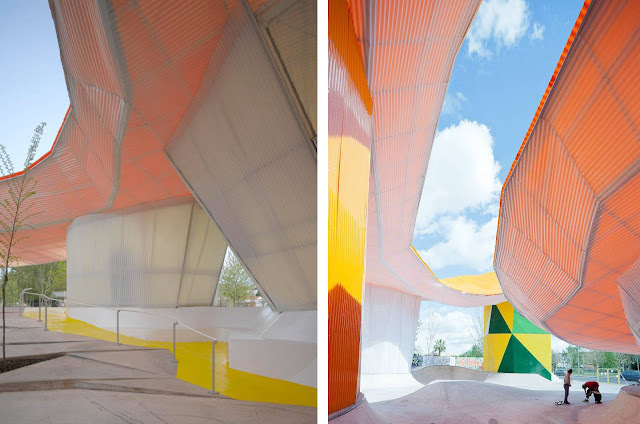 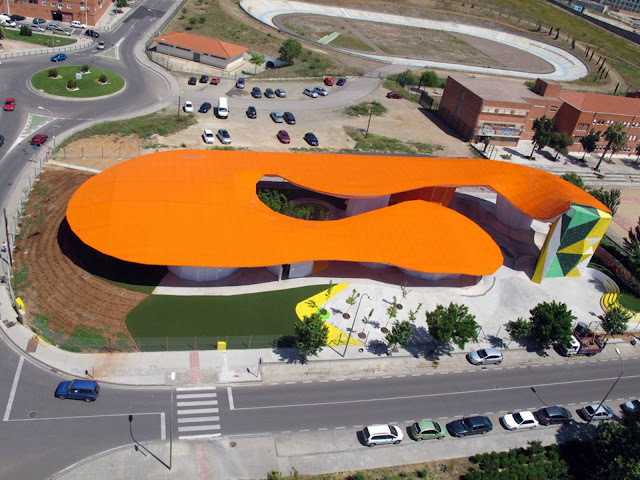 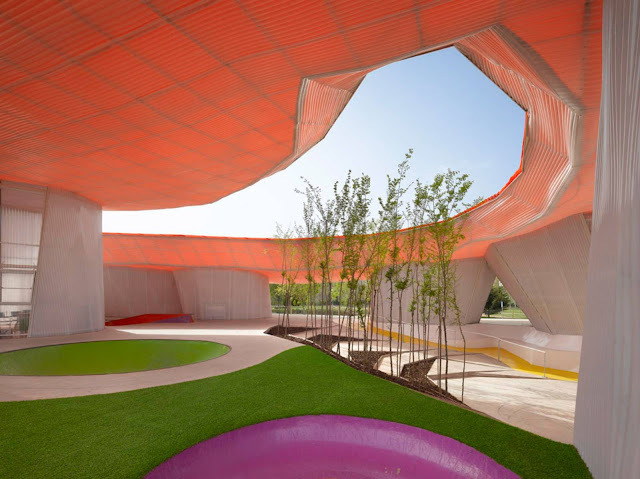 The colorful youth center is very open with its, possibly, most notable feature being a huge orange, organically shaped canopy that protects from rain and the strong hot rays of the sun, typical of Mérida. 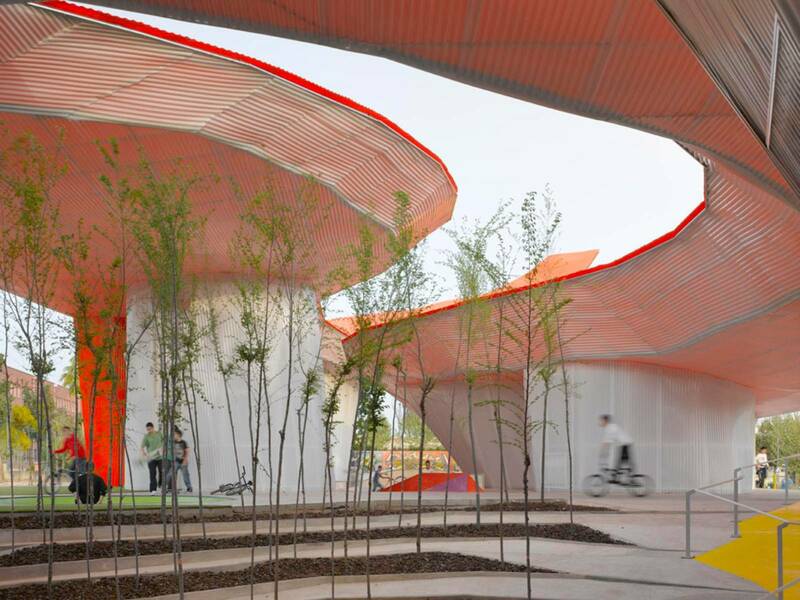 The architects refer to this prominent aspect as a plastic 'cloud'. 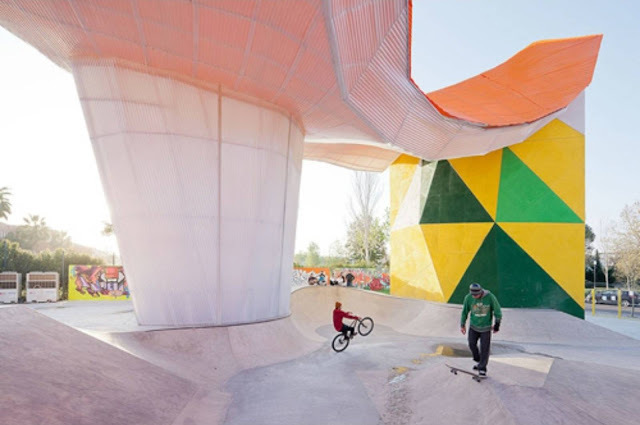 "Skatepark, Rockódromo, broadband Internet, Modding, Tuning, Modeling, Graffiti, Urban Artists, Theatre Street, tightrope walkers, circus activities, Video Art, Electronic Music, Acrobatics, Performing Arts, Manga, Parkour, Audiovisual Arts, Contemporary Dance, Dance Funk and Hip Hop, Dance Hall and MACC (contemporary body art performances) are the recognized activities composing the collective Factory and will join at the consequently so called Factory of Merida. 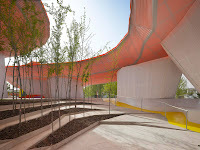 We do not know what type of filter will be applied in the future to the new forth or upcoming activities , but we intend though, within our assigned role as architects, not to have any filter to anyone. Therefore the building is conceived as a large canopy opened to the whole city to gather anyone who may need to shelter there. 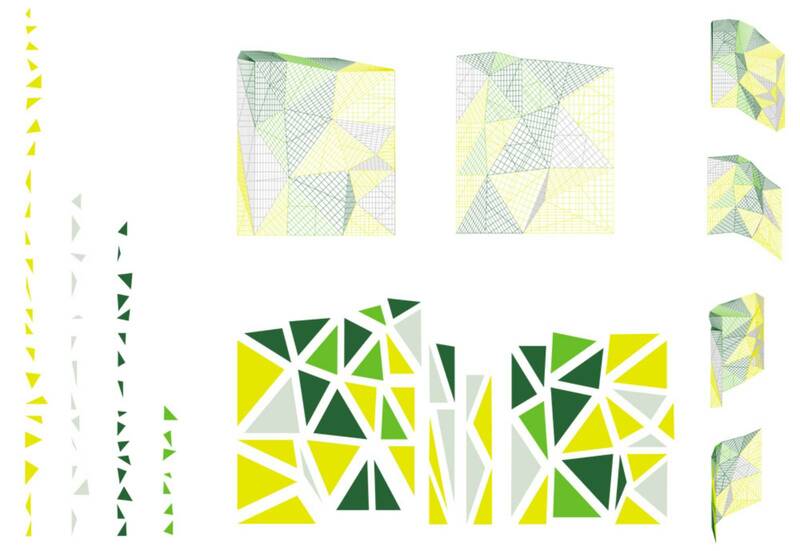 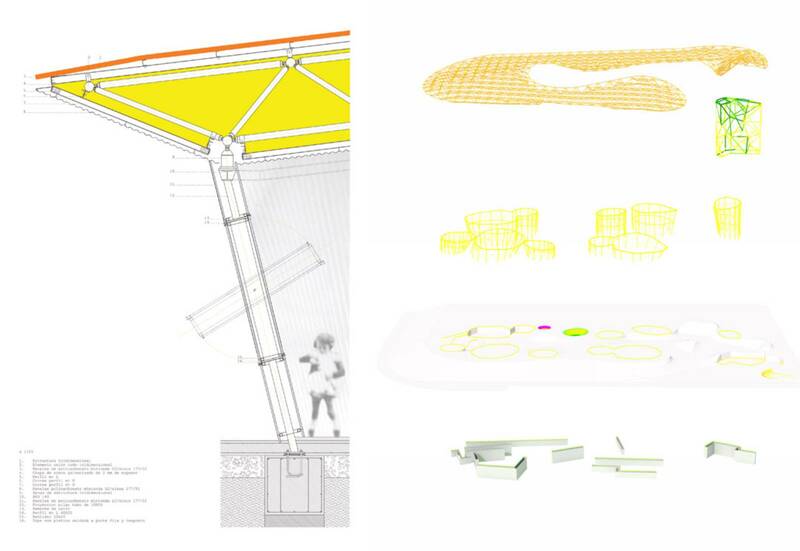 This canopy is supported by a series of ovoid plant parts holding different elements of the requested functions, which are treated as independent modules able to be used separately with whole autonomy, regulated and controlled by the direction of the Factory movement. 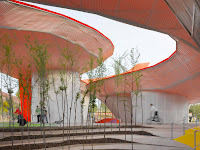 The activities taking place below are covered from rain and sun by the big canopy, acting like a big termical 1 meter cushion, so that there will be no need to use air conditioning. 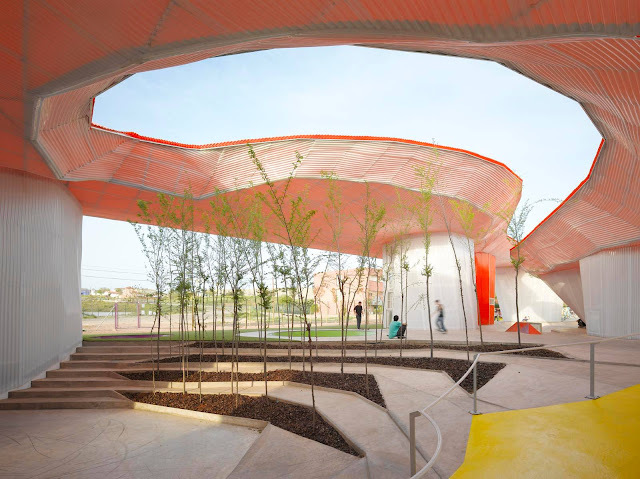 The roof extends, and extends, like a light cloud, protective, translucent; constructed with a three-dimensional mesh structure 1 meter thick covering different levels. 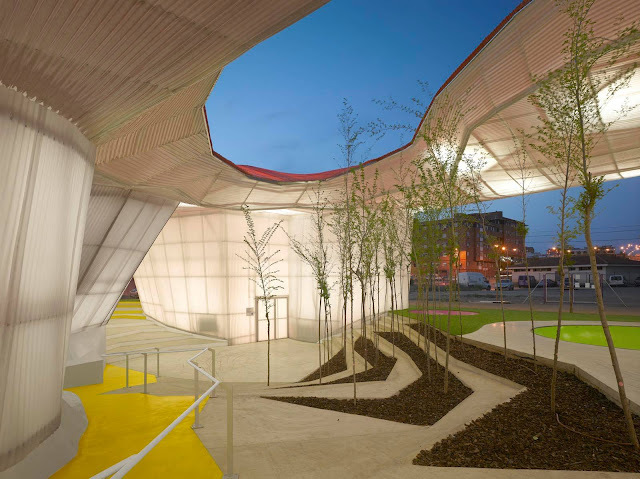 This canopy will rest on steel columns placed in the perimeter of the supporting ovoid elements up to the highest level, where it joins the Rockódromo structure made with the same three-dimensional mesh. 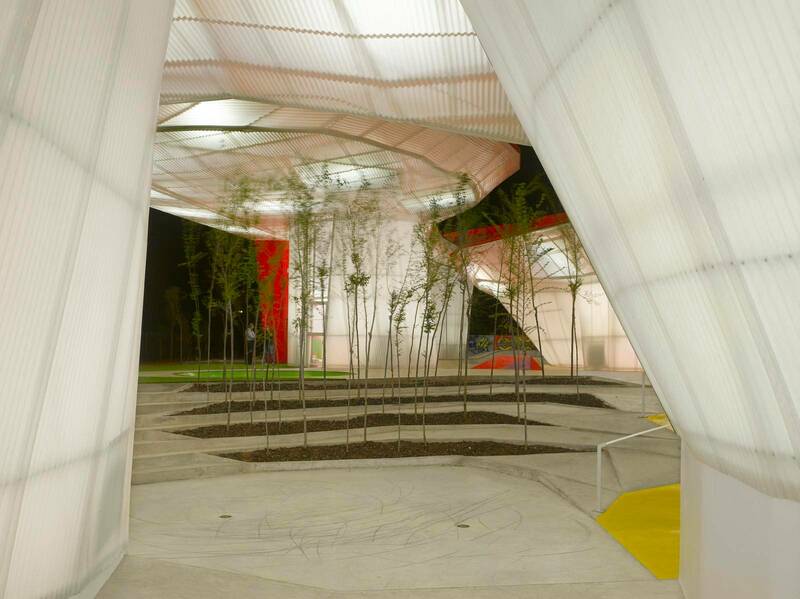 The whole proposal stands on a basement five feet tall so that the sensitive historical base of the city of Merida remains untouched. " Description of the architects.